Last week we had so much fun sharing loads of apple activities as part of our Weekly Virtual Book Club for Kids. Apple volcanoes and apple printing were a hit, in addition to apple towers! I wanted to take a field trip to an apple orchard for some apple picking, but they were too far away to fit it in last week, so we'll have to try another week. This week I am SO EXCITED about our theme. I think it might be my favorite Fall theme (other than pumpkins)! 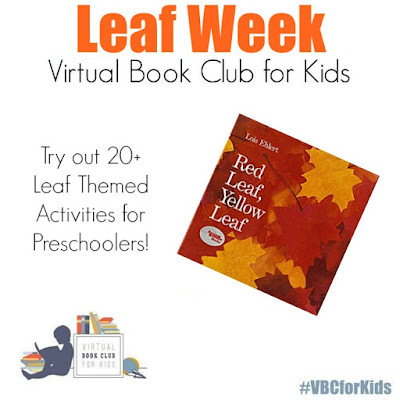 For our Virtual Book Club for Kids this week it is LEAF WEEK! We will have a week full of sharing Fall themed leaf activities while we read Red Leaf Yellow Leaf by Lois Ehlert and several other favorite books about fall leaves. We have a big list of our favorite 20 Fall learning activities for preschoolers and we're excited to add to that list! A few of our other favorite leaf activities include making Fall paper plate wreaths and making a sticky Fall tree! 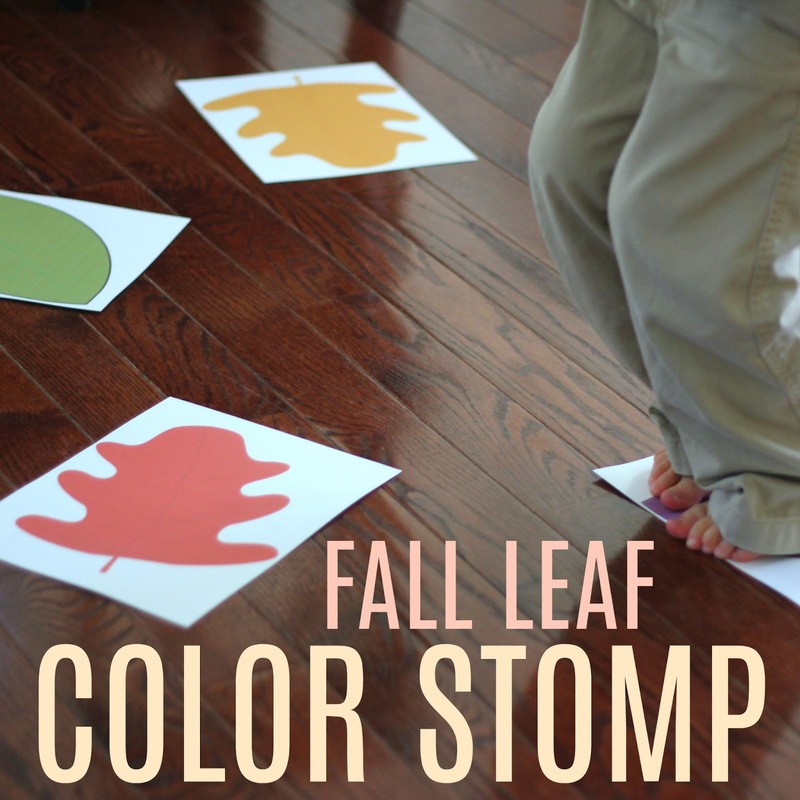 To do our leaf color stomp game all you need to do is print out the leaf movement cards on white cardstock, tape them to the ground, and start stomping! You can turn on some music and stomp or hop or jump from leaf to leaf. While we stomp, jump, and hop I like to call out a color name and the kids will stomp/jump/hop to that leaf and STOP. The goal is to get moving, introduce the color names, and practice recognizing colors. We also work on listening while we play! My big kids have been been having fun calling out the colors while the littler kids run around. If you want to make things a little trickier, you can add alphabet letters or numbers, like we did in this Fall leaf alphabet movement game and this Fall leaf number movement game. NEED SOME MORE LEAF THEMED ACTIVITIES? Check out these great ideas from our Virtual Book Club for Kids co-hosts. Fall Leaf Color Stomp- me!